The ride is still in a planning stage. This is the information as I know it today, 15 May 2018. Come back for any updates -- especially departure times from the pick-up points. 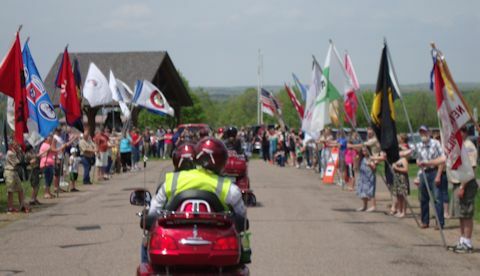 2018 Memorial Day Ride to the Highgorund - The Honor Ride, Neillsville, WI, on Memorial Day May 28, 2018. This ride is open to all bikes, makes, and models. All Clubs are invited. The purpose of the ride is to honor our military veterans. It includes a ride from Minneapolis to the Legion Hall in Neillsville where we meet with other ride groups. We will then parade through Neillsville to the Highground for lunch and a Memorial Service. Our return to Minneapolis will be a scenic ride through the back roads of Wisconsin to the Mississippi River. The registration fee of $25 per rider and $15 per passenger. The fee includes a patch or rocker and lunch after the ride. For those of you with a CB we will be on Channel 1. This ride is being led by Bob Frazee, Chapter Q, GWRRA and will have four stops to pick up riders en route. The Ride will start from Chapter Q's ride point. The departure times for the other pick-up points are estimates but you should be ready to leave at the time stated. Everyone can help the process by printing out the Registration Form, fill it out, and have the exact amount available to pay for your patch/rocker and lunch. I will not be able to make any change. If you don't have the exact change you will have to wait until we arrive at the High Ground to turn in your registration. 9:00 a.m. Depart GWRRA, Mn-Chapter Q's ride point at the mall parking lot behind Culvers on Quinwood Lane North, off Bass Lake Road (Cty Rd 10) just east of I-494. Our basic route will be to travel east on Bass Lake Road (County Road 10) to Hwy 169 and then north to I-694. At I-694 we will head east across the northern suburbs of Minneapolis and Saint Paul to I-94. We will then go east on I-94 to the second pick-up point.